When I first decided to self-publish, I did some online research and discovered CreateSpace which is Amazon.com’s self-publishing platform. CreateSpace offers packages starting at zero dollars! At that time, I was very happy to go this route and my book, The Space Between Thought, would probably have been published and available online a year earlier, if it weren’t for the IRS. CreateSpace is a US firm. I live in Canada. 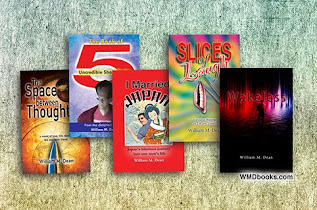 If any of my books sold, then CreateSpace would be writing me royalty cheques. I did not want my meager earnings to be taxed in both the US and Canada so I gathered the required supporting documentation, filled out some paperwork to prevent the US government from taking my money and mailed it off to the IRS. My timing could not have been worse. I called the IRS, waited 2 hours to get a person on the line and asked what was wrong with my application. The person explained that with only 4 possible check boxes for the reviewer to use, there was really no way of knowing. I asked what I could do. Again, she said, there was really no way of knowing... which, I thought but did not say, was kind of the point of my call. I triple-checked everything, made trivial changes and resubmitted. Six weeks later: rejected again with the same box checked. Frustrated, but determined, I surveyed the online community of people who had done this successfully but found no answer. For the price of a free dinner, a friend who had successfully completed this process looked over my final application and declared it valid, before I sent it. Six weeks later: Rejected. Same letter. Same box checked. Eventually, after a lot more searching through online forums, I came to the conclusion that the form letter from CreateSpace declaring that there was a legitimate reason for them to send me money was no longer adequate. I could find no one online who knew this for sure, but evidence was adding up across the globe, in the form of IRS rejections. At any rate, I found this to be an incredibly frustrating and distracting process. I truly hate government forms to start with and I further hate being distracted from writing. I decided to check out the Chapters/Indigo website to see if they had a similar, but Canadian, program. Publishing only within Canada should simplify things, tax-wise. I surfed around looking for reviews of iUniverse and found a lot of hate out there. But the complaints mostly seemed to be from people who were confused, or expecting much more than I thought reasonable. I looked harder and found some love out there, as well. The lovers seemed the more rational. I paid the money online and started the process. About 10 seconds later the receipt appeared in my inbox. It was then that I first noticed that iUniverse seemed to be US-based. Sure enough, Chapters had led me back to a US company which meant that the tax issue that I had now spent gobs of money to avoid would still crop up.